Need some inspiration? Check out these tables we've made! 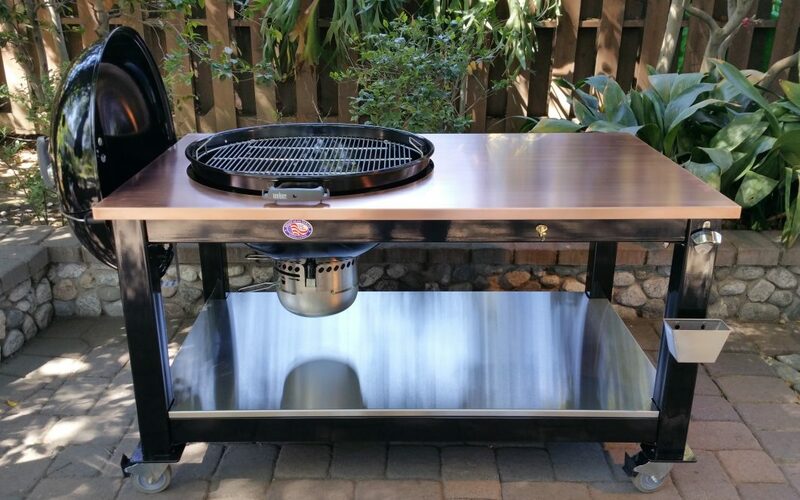 This Custom Brian Alan Table was built with a Beautiful Copper Top to accommodate a Weber 26″ Kettle Grill. Custom options include a Copper Top and Lower 316 Stainless Steel Shelf on a Black Powder Coated Frame. Other add on features include a Lid Holder, Bottle Opener and Catch Can, Brass Utensil Hangers and 4” Solid Rubber Locking Casters. 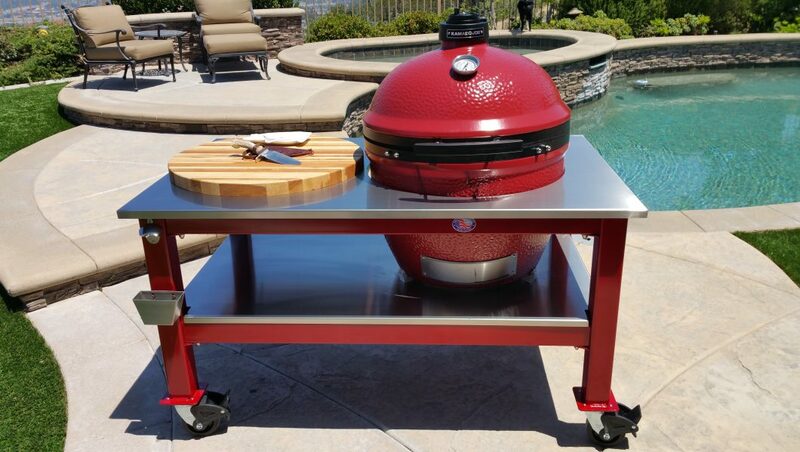 This custom Brian Alan Table designed for the Kamado “Big Joe” is powder coated to match with a 316 Stainless Steel top, lower shelf, Bottle Opener & Catch Can. Easy to clean and safe for prepping food! 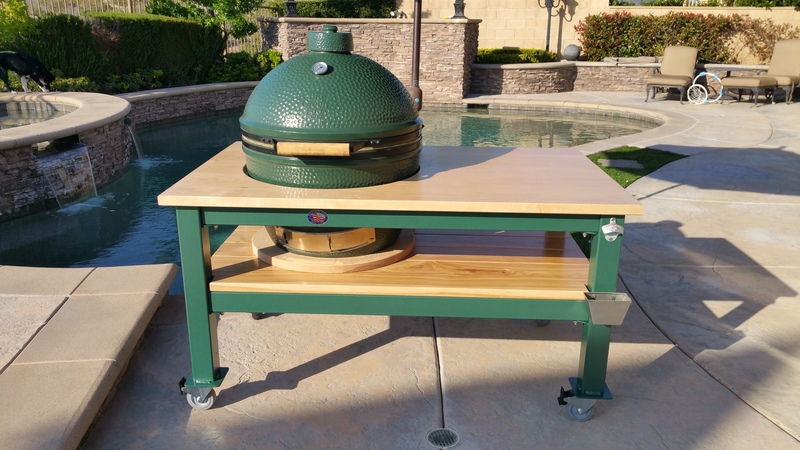 This custom Brian Alan Table designed to house the XL Big Green Egg and powder coated to match. The Knotty Hickory top and lower shelf is a Beautiful working surface. This table will look great in any yard! This Custom Brian Alan Table was built to accommodate Large and Extra Large Big Green Eggs. 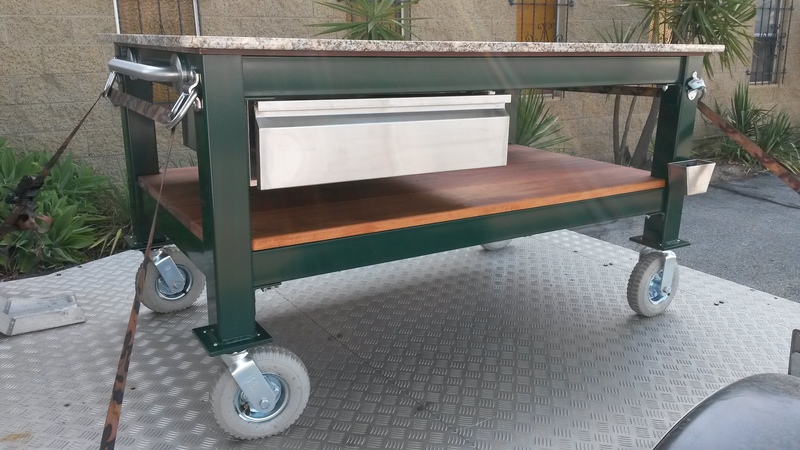 Custom options include a Floreste Verde Granite Top on a Black Powder Coated Frame with a Brazilian and Maple Lower Wooden shelf. Other add on features include Bottle Opener and Catch Can, Brass Utensil Hangers and 5″ Solid Rubber locking Casters. 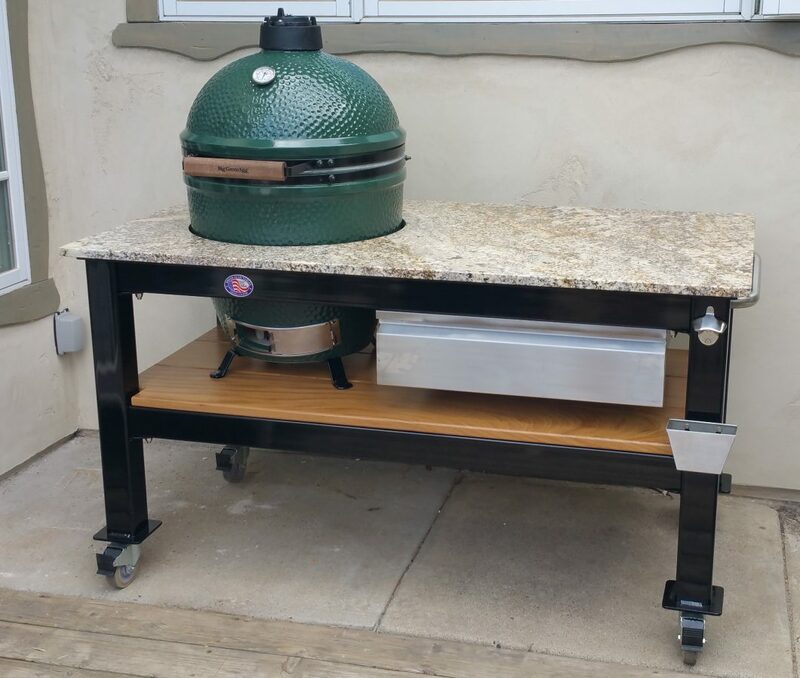 This Custom Brian Alan Table was built to accommodate a Large BGE. Custom options include a Carolina Summer Granite Top on a Black Powder Coated Frame and Afromosia Wood Lower Shelf. Other add on features include a Stainless Steel Drawer, Pull Bar, Bottle Opener and Catch Can, and Brass Utensil Hangers. 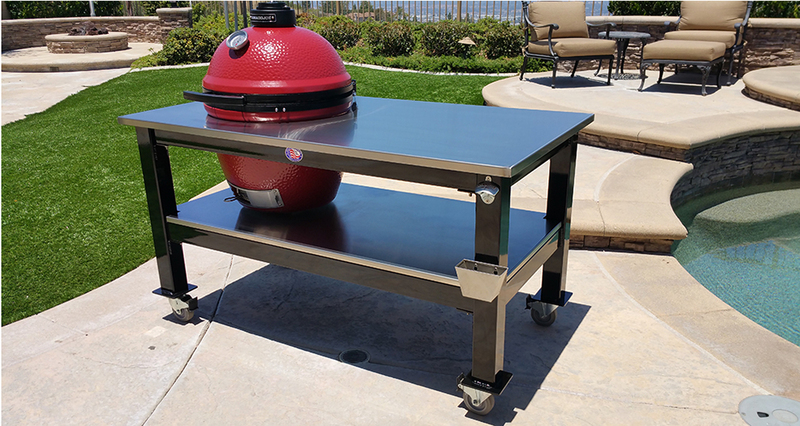 This Custom Brian Alan Table was built to accommodate a 26” Weber Grill. Custom options include a Carolina Summer Granite Top on a Black Powder Coated Frame with a Brazilian Wood Lower Shelf. Other add on features include a Stainless Steel Lid Holder, Bottle Opener and Catch Can, and Brass Utensil Hangers. How sweet is this Brian Alan Table! This custom table was designed for the adventurer! 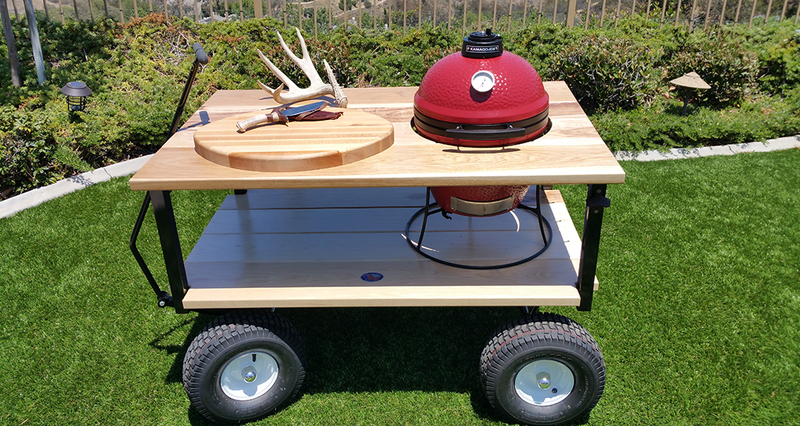 Built to take on the road, this table will house a mini or regular size Kamado Joe or BGE! Designed to house a Kamado “Big Joe” or XL Big Green Egg this table is built with a Hard Rock Maple top and matching lower shelf. This table is nothing short of Awesome! This photo shows the tie-downs in use with the Brian Alan Table. 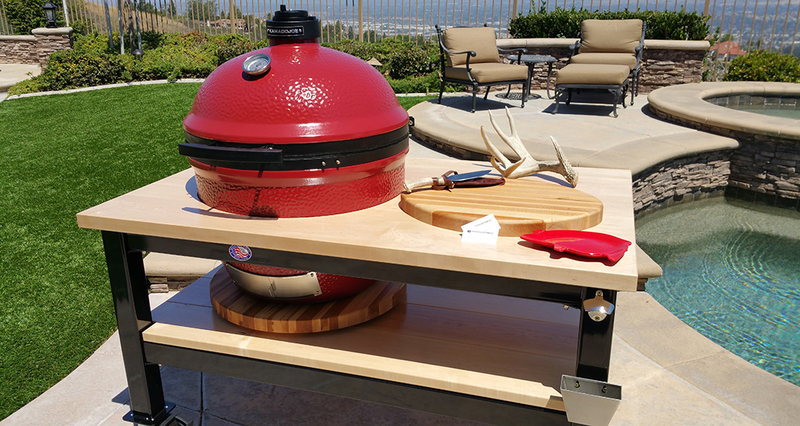 The tie-downs are great for transporting your kamado cooker to a barbecue, special event or campground.